Diabetes retinopathy is a common complication of diabetes where cells at the back of the eye, the retina, become damaged due to high blood sugar levels. If this complication is left untreated, it can lead to blindness. So a product that can prevent blindness without the patient having to undergo laser therapy or surgery, and at the same time save the NHS money, is truly innovative and pioneering. The product in question is short-listed for the IChemE Global Awards 2014, in the Innovative Product of the Year Award category – a joint entry by PolyPhotonix and the Centre for Process Innovation (CPI) in County Durham. 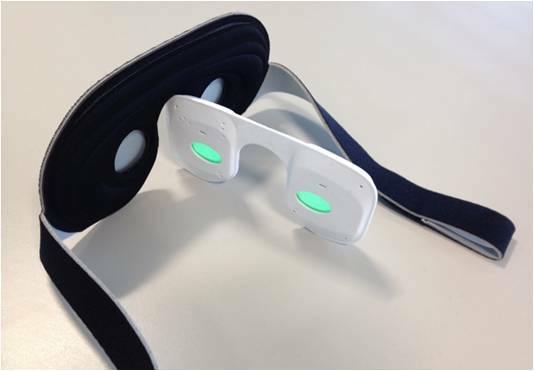 The product developed by PolyPhotonix is a phototherapy eye mask that patients can wear whilst sleeping. Called the Noctura 400 mask, the treatment works by shining a specific wavelength of light through closed eyelids, this light prevents dark adaptations on the retina. It tricks the eyes of the patient into thinking that it’s still daytime, but still allowing the patient to sleep normally. This prevents the rapid creation of blood vessels in the eyes, which normally occurs at night time for anyone with healthy eyes. If this process is not prevented for those with diabetes retinopathy, it can lead to the growth of cysts, thickening of the retina and eventually blindness. So the reason why PolyPhotonix has seen such success is that the mask has been developed from a chemical concept into a manufactured product, which has undergone several successful clinical and efficacy trials, in just six years. Further trials are under way and the plan is to roll out the technology to the NHS next year where it could treat up to 2 million patients a year, and at a fraction of the cost of current treatment. Good luck to PolyPhotonix and CPI at the IChemE Global Awards 2014 early next month, I’m sure you’ll agree with me that this short-listed entry is the definition of innovation. Yes chemical engineers can have a huge impact on such medical devices.